Bicycling was at the height of its popularity in 1896. That year, U.S. factories produced more than 2,000,000 bicycles. But the city of Rochester had banned bicyclists from the sidewalks the year before, and the condition of the city’s streets and roads made riding there impossible. Therefore, sidepath associations were organized to develop separate, cinder paths for riding in Rochester and the surrounding areas. The Scottsville to Rochester sidepath was one of the first of its kind. It was located on the berm of the Genesee Valley Canal opposite its towpath. The Western New York and Pennsylvania Railway was operating on the tracks that had been laid on the towpath side of the prism after the canal ceased operation in 1878. 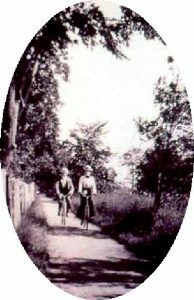 The 10-mile bicycle path between Genesee Valley Park and Scottsville opened in 1896 with a single file of riders leaving the park in a procession that stretched for more than four and one-half miles. The village of Scottsville decorated homes and businesses and provided refreshments to welcome the riders. 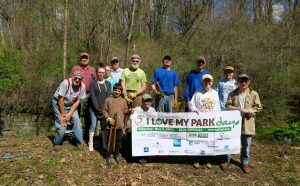 Just like today’s Greenway, volunteer labor was an important part of the sidepath’s development. District Attorney George W. Forsyth’s remarks are as appropriate today as they were when the sidepath was opened in 1896 – “It enables hundreds of people to leave the close confines of the office for an exhilarating ride in the open air, and build up health and friendship between the people of separate communities.” – Rochester Democrat and Chronicle, September 13, 1896. 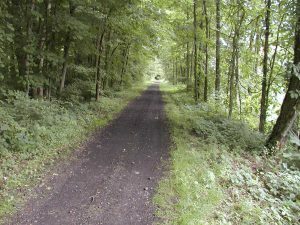 The Rochester area’s sidepath system reached its peak with 143 miles of paths in 1900, but declined and was abandoned by 1907 with the coming of the automobile and a growing interest in golf.